I was informed that a 30-minute worth of Darnell film is available at the 6FM. This is a compilation of all the bits of the Darnell film that I have. I will update this post in a few weeks with the footage showing the the 2 still images shown at the end of my video. What is it you're seeing here? UPDATE: I put everything together including the scene showing Gloria Holt, Stella Jacob and Sharon Simmons and the one showing Marilyn Sitzman interviewed by deputy sheriff Bill Wiseman. The man with him is unknown to me. Thanks for compiling and posting the 2 minute 50 second video (above, this thread) with the hard-to-find three-second Darnell clip at the very end which shows Native American Stella Mae Jacob, and her two colleagues at Texas School Book Company, Gloria Holt and Sharron Simmons, walking down off the edge of the grassy slope and onto the sidewalk. No wonder Simmons looks so tall in the earlier frames -- she was still on grassy slope above the sidewalk! Trask, in his Pictures of the Pain, discusses the camera typically used for TV news motion pictures. The workhorse camera was a Bell and Howell Filmo 70, a 16mm format capable of filming at various speeds but normally at 24 frames per second. There are plenty of photos and films showing Darnell, Couch, and many other cameramen using this model of camera. The camera features a lens turret holding up to three lenses. Thus, the cameraperson could readily select an appropriate lens for a given scene. I don't know if those lenses were standardized throughout the news stations and Trask does not indicate what lenses were used by either Darnell or Couch. Film from the DCA shows Darnell's camera had at least two lenses, while a third could be present but is blocked from view. Someone in a different thread (Thomas?) asked if the focal length of Darnell's camera was known. Fortunately, knowing the film frame field of view (FOV, degrees) and image size (h, mm) of a standard 16mm frame we can calculate the lens focal length (f, mm). The FOV can sometimes be determined by matching the image details to a 3D model, or a map with sufficient detail, once the location of the camera is also determined. The image size for standard 16mm film is 7.49mm height x 10.26mm width, for an aspect ratio of 1.33. For the purpose of using the given formulae above the frame width h=10.26mm. I modeled the various scenes in Morissette's combined Darnell frames, with the following results. Note that the frames with Sitzman and the three women Jacob, Holt, and Simmons have aspect ratio of 2.36 – indication of significant cropping of the vertical dimension. The scenes in the table were analyzed in the order they appear in Morissette's compilation as of 20190408. *Couch also used a 15mm lens on his Filmo camera (38 degree FOV) for his scene coincident with Darnell's doorway scene. ** Uncertainty determining an accurate camera location for this scene gave values slightly high. ***The scene with Marilyn Sitzman was very likely filmed before Darnell filmed Jacob, Holt and Simmons, imo. 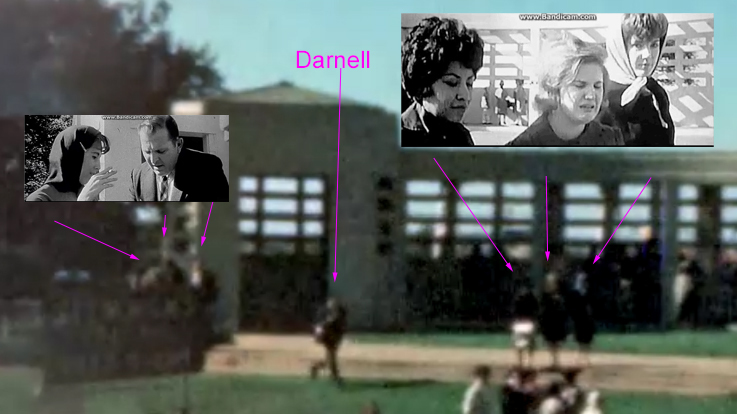 I base this on placing Darnell very near the Zapruder/Sitzman pedestal for her interview. In a frame of Tina Towner's film at the Sixth Floor Museum web site I see, (with borderline pariodilia) upper bodies of Sitzman, her interviewer (Bill Wiseman per Denis' reply #3 this thread) and a man to his left. Shortly after Darnell films the Sitzman interview he pops out from behind the Stemmons sign and hustles eastward towards the three women to then capture their images. Just looking at the frames from Darnell's clip, do they look as though they could have been taken with a long focal-length lens, and that the photographer was standing, say, on the sidewalk on the north side of Elm Street, or does it look as though he was standing pretty close to those three gals and was using a shorter focal-length lens? No, it not possible that a much longer lens further away could give a comparable scaled view of the girls in Darnell. To demonstrate I simulated the Darnell line-of-site to the three women, and extended that line-of-site to beyond the Elm sidewalk to over 150 feet from the women. The simulation shows the frames holding nearly the same section of the pergolla to frame width while moving the camera towards the women on the line-of-site and adjusting to the necessary focal length along the way. A companion overhead view is included. Please observe the relative sizes of the model's heads to the pergolla cutouts as the camera nears the subjects. The numeric annotations show FOV (field of view), f (lens focal length, mm), and D (distance of camera to subject women in feet). I estimate Darnell was about 11 feet from the women. Yeah, I was thinking ten, myself.